We’d love your help. Let us know what’s wrong with this preview of A Family in Paris by Jane Paech. Through a collection of sharp observations, insightful travel articles and laugh-out-loud anecdotes, A Family When Australian Jane Paech moves to Paris, her visions of afternoons in bijou bistros and bookshops on the Left Bank are kept in check by the needs of a young family and a long to-do list that includes apartment-hunting, school selection, and multiple trips to IKEA. To ask other readers questions about A Family in Paris, please sign up. For many, the thought of living overseas is the dream of a lifetime. Make that location Paris and heads fill with thoughts of food, romance and fine living. 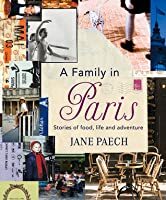 Jane Paech did that for six years with her family, and their experiences were chronicled A Family in Paris: stories of food, life and adventure. Chronicled is perhaps not the right word, for the book is thematic rather than strictly sequential. The chapter titles reflect the author’s feelings for this magical city. After the first heady impr For many, the thought of living overseas is the dream of a lifetime. Make that location Paris and heads fill with thoughts of food, romance and fine living. 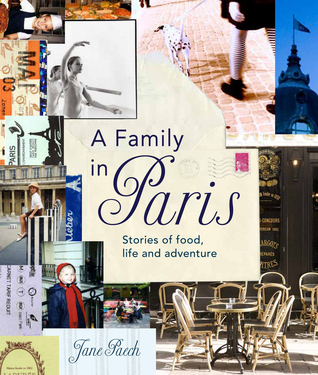 Jane Paech did that for six years with her family, and their experiences were chronicled A Family in Paris: stories of food, life and adventure. Chronicled is perhaps not the right word, for the book is thematic rather than strictly sequential. The chapter titles reflect the author’s feelings for this magical city. After the first heady impressions of ‘we’re living’ in Paris’, disillusion sets in as Paris reveals herself, warts and all. The warts are often a spectacularly unhelpful bureaucracy. Added to that is the pain of trying to adjust to a very different set of assumptions. Finding an apartment takes on a whole new meaning when you have provide your own bench tops, doors and ovens. Waiting for weeks for your husband’s employer to approve you buying these things, and a comical (to the reader, but certainly not to the protagonists) back-and-forth battle with the local IKEA to get them fitted would make most of us want to pack our bags and head homewards. Perhaps the hardest part of any relocation is adjusting to the locals. I may never get used to South Australians meeting newcomers invariably asking which school one attended. In Paris, it’s important to learn that when gong to dinner, to be a little late, but not too much. More formal occasions demand that guests don’t begin drinking until everyone’s arrived. In Australia, you’d never find that people respond to ‘we must have you around for dinner sometime’ with ‘thanks, but we have too many friends already’. But Paech’s book reminds us that living overseas broadens our horizons. Australian vague offers of dinner can be a politeness not followed through with because those offering most likely already have more friends than they can fit into their busy schedules. I know several newcomers to these shores that have taken such vague offerings at face value and have been disappointed when the proffered (and, at the time sincerely meant) get-togethers didn’t materialise. Perhaps Australians place a high priority on making new acquaintances feel at ease, and Parisians letting them know how things stand. Which social practice is better? The discussion of French education also revealed fascinating divergences in practice. Elder daughter Annabelle found the adjustment from Australian to French education extremely difficult. Teachers often ridiculed students in a way that would be considered bullying here. But French students quite often finish school with a superb knowledge of their own language and culture that makes learning other languages easier. At the end of the book, Paech quotes her daughters’ views on the differences. In short, Australia praises kids and tells them that anything is possible; in France, they recognise this isn’t possible and try to make students resilient. This work is not a critique of Parisian society. It is a finely textured personal examination of cultural adjustment. It like a series of love letters revealing the highs and lows of a complex but rewarding relationship. We feel Jane’s emotional jolt when finally the time comes to leave. The finale resembles a poignant visit to an old lover. Everything remains largely the same, but is veiled by the past. Add to this the lovely photography that not merely illustrates but adds to the depth of the text and you have a lovely book wroth lingering over. If you are after a travel book, this may not suit you, though there is a lot of useful travel information within. If you prefer sequential narratives, you might find this work a little off-putting. If you are interested in the problems and delights of cultural immersion, you simply must read it. I found Paech’s book exquisitely delightful. But then, I am biased for, of course, I love Paris as well. This is the living in Paris book I have been trying to find and just happened to pick it up randomly at the library when I was looking for a good book to read. Quelle suprise! I loved her observations and daily life snapshots. It really brought out what I think the real experience of living there with a family would be like and reminded me that I never NEVER want to live there, especially with kids. Visit yes, live in the city proper, no way! An essential book for anyone moving to Paris to live. Warmly describes the culture, the people, the problems and the beauty. And the all-important tip: Rentals in Paris don't necessarily come with a kitchen! Gorgeous hard book from the library. Photos are so inspiring! Scattered funny anecdotes and a surface insight into daily life in Paris, not much to recommend it otherwise. Well, I love Paris, so of course I liked this book. But It was interesting and has lots of stores, restaurants, museums, etc. to help plan a trip to Paris. I enjoyed reading this. It probably helps that I am heading to Paris and am therefore doing research, but irregardless, it is still an enjoyable read. Jane's description of the trials and tribulations of daily life in Paris did make me wonder if I still want to go. The seriousness and intolerance of Parisians (thus described) is an alien mindset to most Aussie (and other) outsiders. There is no doubt that Paris is a beautiful city, but intimidating too. This book maybe non fiction, but it is cert I enjoyed reading this. It probably helps that I am heading to Paris and am therefore doing research, but irregardless, it is still an enjoyable read. This book maybe non fiction, but it is certainly no reference book. It is a hotch potch of events and tales - entertaining but random. Many have applauded the photography throughout the book. I didn't enjoy it to the same extent. I did like the quotations chosen to accompany the text and I really like the "Julie calls...." snippets. Love this book. It is my bedtime reading. Jane Paech and her family moved from Australia to Paris as expats. The book is a series of vignettes about Jane, her husband and their two preteen daughters adjusting to everyday life as they attempted to settle in. Relatively simple events turn into monumental tasks as a result of language barriers and cultural differences. At times the book reads like a Frommer's Guide to Paris. Jane documents places that she has frequented and lists them at the end of Love this book. It is my bedtime reading. Jane Paech and her family moved from Australia to Paris as expats. The book is a series of vignettes about Jane, her husband and their two preteen daughters adjusting to everyday life as they attempted to settle in. Relatively simple events turn into monumental tasks as a result of language barriers and cultural differences. At times the book reads like a Frommer's Guide to Paris. Jane documents places that she has frequented and lists them at the end of each chapter. Experiences in shops and restaurants, trip to landmarks, and "don't miss" sights are well described. She speaks lovingly about merchants who have been in business for years and sell their products with pride. Jane has a way of writing that makes the reader feel like she is speaking directly to them as an old friend. Fun book, loved the ribbon page marker. I love this cover, both the dust jacket and underneath. For anyone familiar with Paris, this is a lot of fun to read and I jotted down many vocabulary words in addition to salient addresses. I was amused by many of her anecdotes and read them aloud to great laughter. She is an engaging and witty recorder of events and situations and I really enjoyed the reading of this in a classy and visually appealing format. My only criticism is her timeline and and how she jumped around chapter or snippet to I love this cover, both the dust jacket and underneath. My only criticism is her timeline and and how she jumped around chapter or snippet to snippet. While she acknowledges this in small print at the book's end which I read before starting, it still felt gathered after the fact which jarred a little. Given her distance from all that happened, it seems simple laziness on her part not to have stitched it together in a more readable fashion. I absolutely LOVED this book. I have lived in Paris briefly and always wanted to return. This book was extremely enlightening to me. I finished it and instantly felt sad and longed to meet the author and befriend her, a real testament to how winning her voice is. I look forward to reading more of her work and giving this book as a present to my Francophile friends. Nice pictures, bloody awful read. There are so many other great books out there about living in France and/or Paris - this one is such a let down. The author's narrative voice and her 'insights' are nothing short annoying. Many of the tips and hints about the French and life in France are heavily borrowed from other books. Borrow it from your library for the pictures, but don't waste your money. The very brief time I spent in Paris seems to really "fit" how out-of-place that beautiful city can make you feel if you are NOT Parisian. The author give so many revelations on where you should spend you time rather than visiting all the tourist spots. This book will be my guide if I ever get the chance to go back. This is a lovely coffee table style book with beautiful photography and courageous stories. Particularly inspiring as the author stepped away from her nursing career in Australia to support her husband in an overseas move....and decided to become an author along the way! I have read this book over many weeks. It was always delightful to pick it up and become familiar again with Jane and her family. To me it was the next best thing to actually being in Paris - I loved this book. I loved this book! The page design and photographs are gorgeous. I learned many interesting details about Paris even though I have been there many times. Great details of everyday places to visit. Good insight into how Aust kids cope? In French school system. Use with my classes here. A visual feast, and a realistic look at an Australian family attempting to live in Paris. No more Paris Syndrome for me after reading this.